Four one-act plays by Tennessee Williams – one cast! A repertory company of six talented and versatile performers will present an evening celebration of Tennessee Williams, throughout February, at the Drayton Arms Theatre. Carefully selected by Creative Producer Sarah Shelton, the plays include early versions of The Glass Menagerie and A Streetcar Named Desire; as well as two shorter curiosity plays. 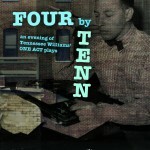 Four by TENN promises to delight and entertain, not only the season Williams enthusiast, but those new to his work. Drayton Arms Theatre, 153 Old Brompton Road, SW5. Saturdays at 2.30pm and 7.30pm.